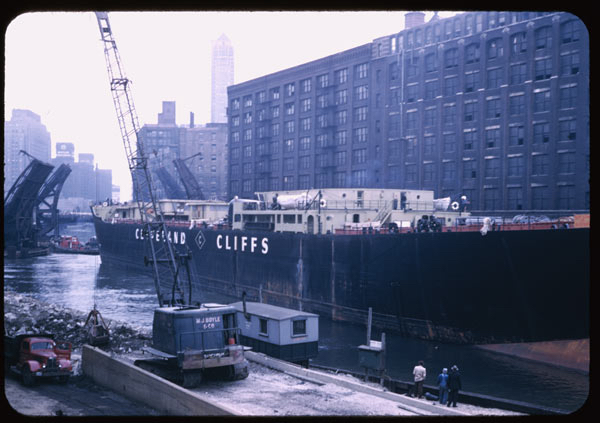 May 9, 1951 – The 620-foot Cliffs Victory, missing its rudder and guided by two tug boats, front and back, makes its way slowly through the Chicago River and out into Lake Michigan. It is the longest ship ever to move through the inland waterway from the Atlantic to the Great Lakes, and it takes two hours for the great ship to move from Harrison Street to the lake. The closest squeeze comes at the Van Buren Street bridge where the bridge’s abutments narrow the channel to just a few inches wider than the ship’s 70-foot beam. The tugs Louisiana and Utah inch the converted liberty ship through with “some of the black paint scraped from her plates.” [Chicago Tribune, May 10, 1951] Onlookers along the main stem of the river gape as in several places the big ship passes with her stern just clearing an upraised bridge as her bow is abreast of the next one over a block away. Since the lock at the mouth of the river is 20 feet shorter than the Cliffs Victory, special arrangements have to be made. She is run up until she nearly touches the east gate of the lock, and ropes are run from the ship’s winches to mooring posts along the lock. The the gate is opened, and water from the lake, nearly 18 inches higher than the river pours in, pushing the ship back. “Then with two tugs straining furiously,” reports the Tribune, “and the winches pulling in the mooring lines, the ship began to move against the current. Fifteen minutes later the stern cleared the west gate and it was closed, stemming the flood into the river.” From Chicago the ship is moved to South Chicago where she will be re-fitted for ore duty on the Great Lakes. I don't remember the Cliffs Victory but I do remember the Medusa Challenger. It was a monster freighter in more ways than one. At 562 feet, it was the longest ship to use the river on a regular basis. It appeared to fill up the waterway as it slowly wound its way inland to the Material Service yard, filled with portland cement. It was christened the Medusa Challenger, aptly named for the mythological Greek beast whose visage could turn people to stone. And from 1968 to 1979, the Tribune reported at least 20 instances of the bridges malfunctioning when the frightful ship was nearby. That may understate the scope of the curse. On many occasions, multiple bridges refused to budge on a single round trip by the Medusa. Or one bridge refused to open, but the ship was so long that two other spans couldn't close while the Medusa was immobilized. The bad luck was so regular that in March 1973, the Tribune reported when NO bridge got stuck. To pedestrians and motorists downtown, it was a major inconvenience. In some cases, the bridges were frozen for a couple of hours. On Sept. 23, 1970, the Lake Shore Drive bridge jammed 6 feet short of closing. It took nearly an hour to fix, but impatient pedestrians refused to wait and jumped from one span to the other. An enraged bridge-tender shouted, "Get off my bridge! It's not safe! Get off!"